Today Ancu from Hidden Valley hosted our weekly wine club tasting. 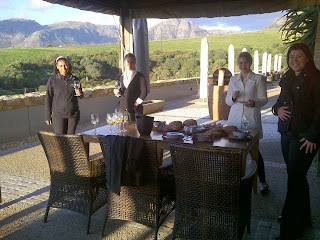 It started off with a lovely cheese board outside with their stunning MCC. We had such beautiful weather that this was just the way to finish a day of work!! The MCC was delicious and I highly recommend one purchases a bottle. The cheese, olives and preserves were fantastic also. Hidden Valley does picnics for around R300 for two people which includes a bottle of wine, so perhaps inquire about this before you plan a visit here. 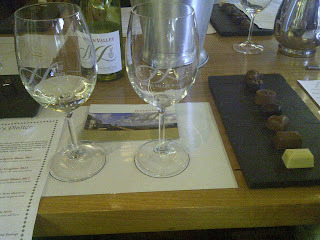 For tonight's wine club evening, Hidden Valley set up a chocolate and wine tasting for us. What a treat it was!! To do a chocolate and wine pairing costs R60 per person. Ancu told us that Dave Hidden is the owner and hence the name Hidden Valley is named after Dave. Their winemaker is Emma Moffat and she has been there for four years. We started the tasting with the Sauvignon Blanc 2013 at R80 a bottle. This was a beautiful intense tropical fruity SB. Lovely fresh acidity. Powerful fruity nose. I liked this wine a lot!! Viognier 2012 (R80 a bottle) had grenadilla and feijoa on the nose, lightens off to more pear, citrus and peach. Very smooth on the palate with tones of citrus. Fresh acidity on the palate and a lingering lime finish. This Viognier was slightly oaked. I found this to be a unique citrus Viognier but I liked it. Chenin Blanc 2012 (R84 a bottle) had light acidity, slight pineapple on the nose, stones fruits like peach and apricot with slight spiciness on the palate. Slightly tart/sharp/fresh. Found it to be sharp/acidic especially on the finish. Pinotage 2012 (R75 a bottle)had dark berry flavours and a bit of mocha. It was a little dry and had light body. It was ok.
Hidden Secret 2011 (R145 a bottle) had a gorgeous fruity nose. It was spicy, smoky, fruity and dry on the palate. Medium body. Little serious and heavy. A bit young to be drinking now. Hidden Gems 2011 had a lovely fruity nose, plum flavours on the palate, powdery tannins, soft fruity, light-medium body. I liked it but I think it needs to be decantered. I thought the chocolates all paired very nicely with the wine!! It was a great chocolate and wine pairing! The chocolates were so delicious I bought 2 packs. One pack is R60 and you get 7 chocolates in each pack. 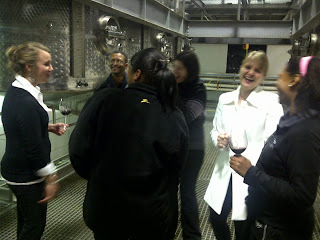 Ancu also gave us a tasting of the Chardonnay 2012 (R90 a bottle). This had a yummy nose, it had buttery tones on the nose and palate and lovely citrus tones. Pineapple, green apple, lemon zest. Waxy finish. I liked this Chardonnay!! 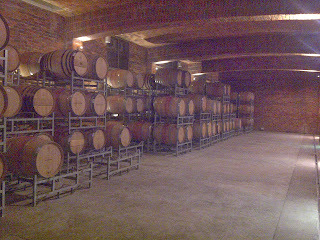 After our tasting Ancy showed us around the cellar. This is always fun and interesting. 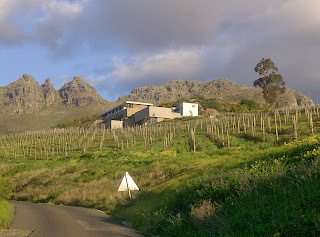 We had a great wine tasting experience here and I would highly recommend one visits this estate and especially do the chocolate and wine tasting!!! 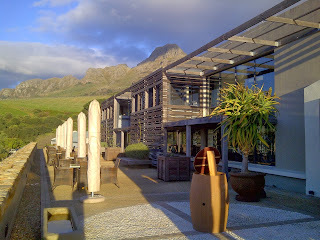 They have picnics availableat R300 which includes a bottle of wine, full picnic basket and blanket. 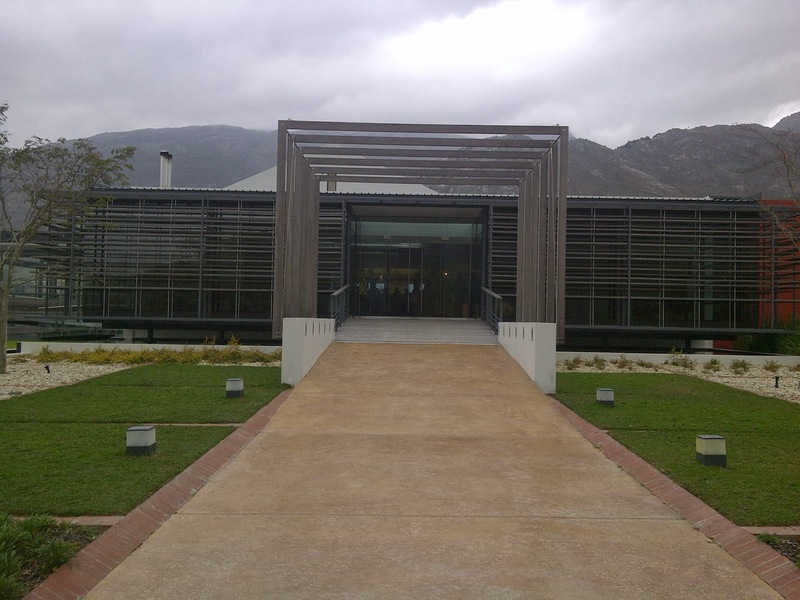 They have a stunning dam not far from the tasting room where you can enjoy your picnic. You need to book this three days in advance. To do this contact Ancu on 021 880 2646 or email her on info@hiddenvalleywines.co.za. They also do cheese platters for R250 which serves two people with three cheeses, hummus, soup, spicy relishes, olives and olive oil. You also get a bottle of SB, Pinotage or a tasting for two. 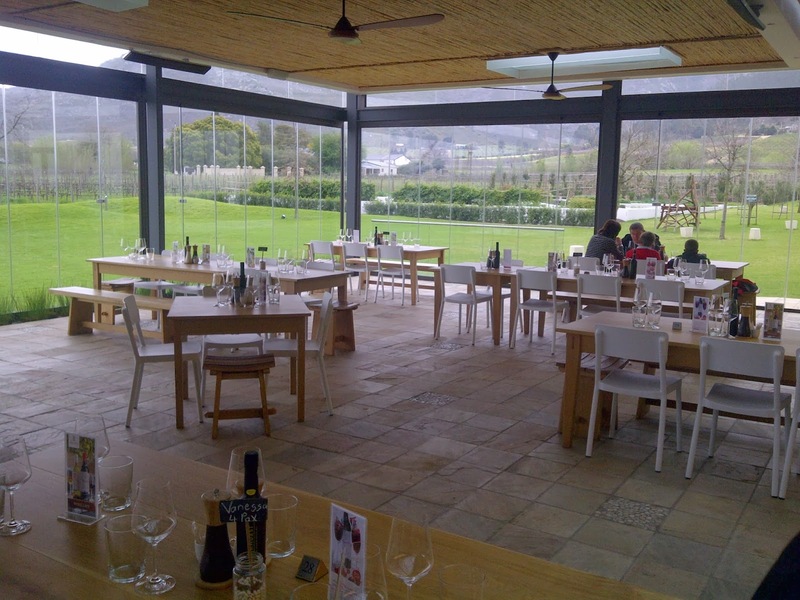 An Olive and wine tasting costs R40 per person. A normal wine tasting is R30 per person and refunded on purchases of 2 bottles or more. 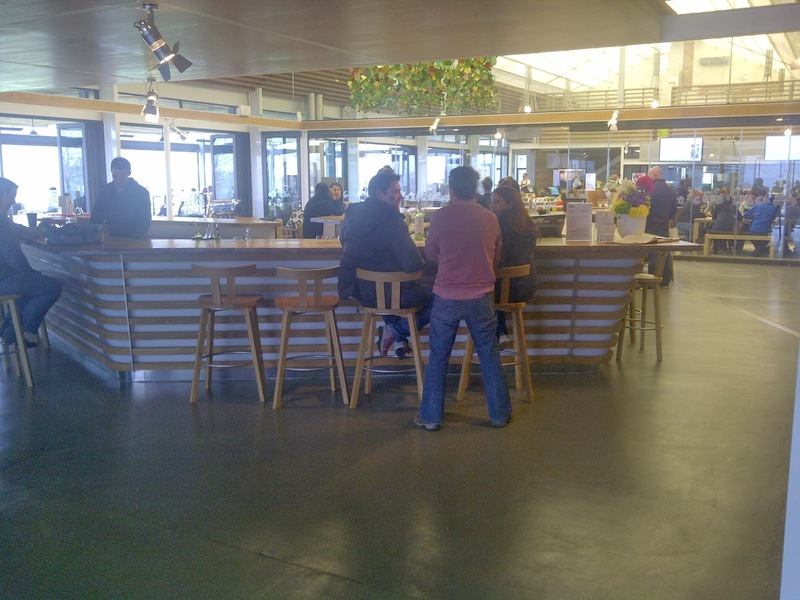 Today was Uncorked in Franschhoek which we hadn't realised when we decided to visit Leopards Leap for lunch and a wine tasting. This meant we could only taste three wines which were the Sauvignon Blanc 2013, Pinotage Rose 2013 and the Merlot 2011. Even though this place is commercial, it had a nice feeling to it and I felt they had created a nice styled place with a good atmosphere, it did help that a festival was on of course. I recommend coming here for lunch as that was a very nice experience. In regards to the wine tasting, I wouldn't say I would go out of my way to do a tasting here, but if you come for lunch then you might as well do a tasting here also. Classic Sauvignon Blanc 2013 (R38 a bottle) was very fresh. Beautiful tropical fruits on the nose and the palate. Soft, citrus, with balanced acidity. Lingering lime finish. Pleasant, fresh, I liked it. Lookout Pinotage Rose 2013 (R33 a bottle) had a candyfloss colour and aroma. Sugary nose, crystalised sugar aroma. Soft, tart, little sharp finish. Classic Merlot 2011 (R42 a bottle) lacks aroma, taste and has powdery tannins. It was fruity though. We went through for lunch after our tasting. 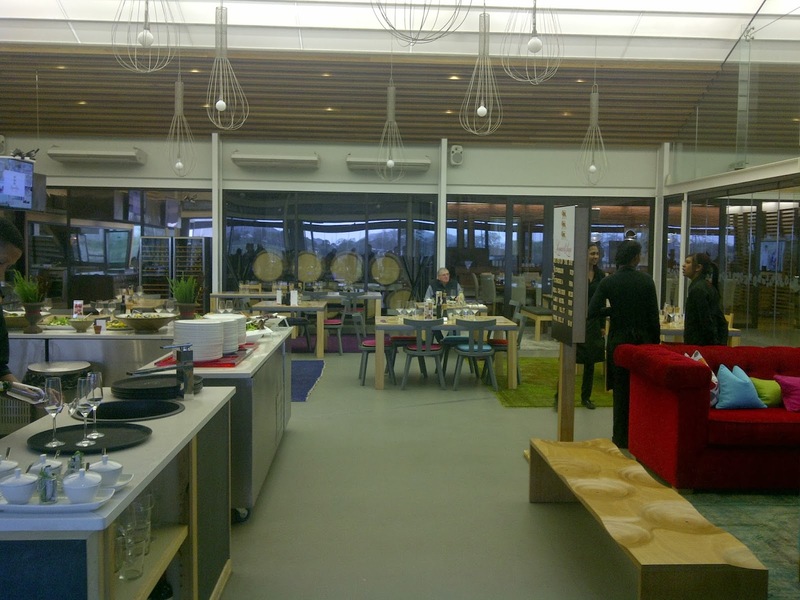 After you have been seated you can go to the buffet section and choose all your salads, vegetables and meat. They weigh your salad and vegetables and then the meat is a set price. We all thoroughly enjoyed our meals. 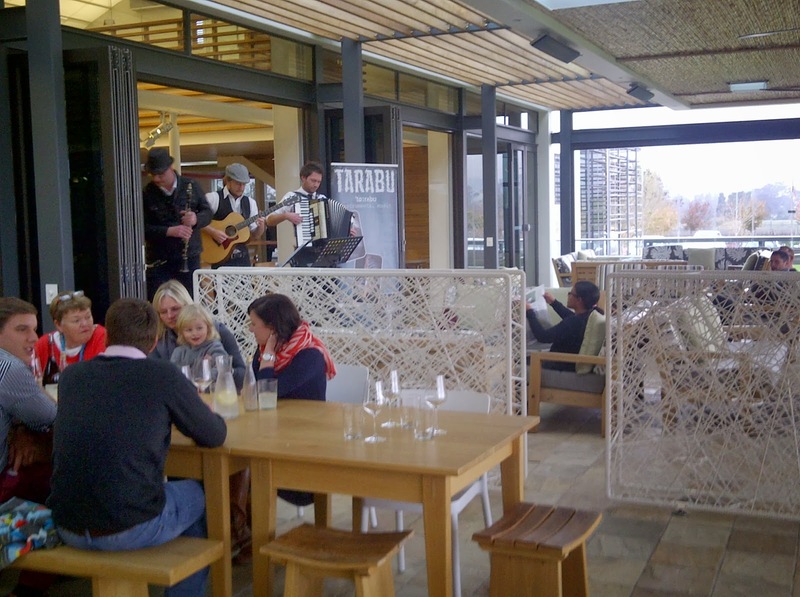 Because the Uncorked Festival was on we were able to enjoy live entertainment which really set the mood. It was a great lunch experience we had at Leopards Leap. We tasted the Family Collection Shiraz Mouvedre Viognier 2009 with our lunch. This was smooth and fruity. 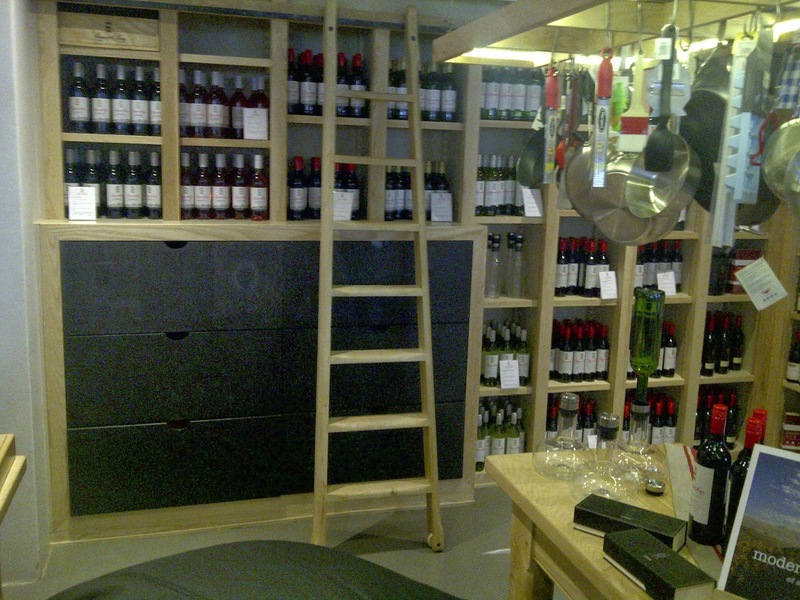 After lunch I had a look at the shop they had with many different products, some for the kitchen and others more wine related. It is a nice shop with some interesting items.